Last season, Val d’Isère embarked on a €16 million revamp of the Solaise area. Out with the old 4-person Solaise chairlifts, and in with brand new 10-person gondolas boasting 91 cabins complete with heated seats and Wifi. It was a key upgrade which boosted the lift capacity by 40% to an impressive 3,600 people per hour. The resort also created a brand new nursery area as well as a North American-style day lodge, with stylish indoor and outdoor seating ideal for picnicking! After these huge changes you could forgive the resort for resting on its laurels a little, but Val d’Isère is now looking to embark on its biggest project yet – Le Coin de Val. What is ‘Le Coin de Val’? Le Coin de Val is the name given to the £170m project to redevelop part of the town centre over the next 5 years. The resort has classified it as ‘the most ambitious building project undertaken anywhere in the Alps in a generation’ and will be even bigger than the construction of Les Arcs 1950 14 years ago. The area being redeveloped is a giant triangle in the centre of resort covering 22,000 square metres. It stretches for around 250 metres along the Avenue Olympique from the main bus station towards La Daille. The project will consist of the complete demolition and reconstruction of the resort centre, with 30-year-old buildings being replaced and many of the well-known businesses including Dicks’ Tea Bar and Le Petit Danois having to relocate. The idea is to recreate the aesthetic of those traditional old alpine villages, and avoid any large constructions to retain an authentic look. A new piste from the slopes to the new development so guests will be able to ski back to their accommodation. An underground walkway so pedestrians can walk from the centre to the Solaise and Olympique gondola. Two three or four star hotels and new residential buildings creating 900 more beds, bringing the total in resort to 25,760. Pedestrianised commercial area with reception, children’s nursery and enclosed bus station. 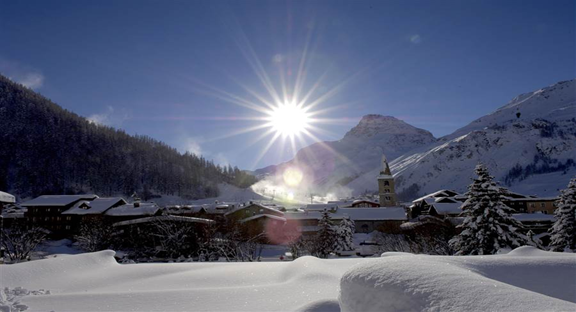 On top of all this, Val d’Isère will see the opening of the highest hotel in France – Le Refuge de Solaise! The former Tête de Solaise lift station is being converted into a 4* luxury hotel sitting at 2551m, 800m higher than the rest of the village. The hotel will have a traditional 14-bed dormitory alongside 34 bedrooms and 3 luxury apartments, plus a 200-seat restaurant which will be open to the public during the day. A cocktail bar, seminar and projection room, children’s play area and spa with 23-meter swimming pool will complete the project. The refuge will only be accessed by the ski slopes and Solaise Gondola lift, so when the lifts close the hotel will be cut off from the resort to offer a peaceful retreat away from the hustle and bustle of Val d’Isère. (Perhaps not ideal if you’re looking to go out in the evening, as you won’t be able to!) During the summer, the hotel will be accessible via the Col d’Iseran –the highest paved road in Europe. Due to the fantastic location of the summit of Solaise, the hotel will also benefit from 5 more hours of sunshine than anywhere else in the resort, as the sun rises two hours earlier in the morning and three hours later in the evening. Le Refuge de Solaise will be open for guests this winter 2018/19! The Coin de Val is a longer-term project, expected to take 5 years. The project begins this Autumn with environmental studies before the final business permits due to be granted next Spring. Work will be completed in phases to ensure minimal impact for tourists visiting the resort, with the aim of completion by 2022. Like many of our customers, we’re excited to see how Val d’Isère will change over the next few years. For more information or to book your own trip to Val d’Isère, give us a call on 020 3080 0200 or reach out via our handy online chat service.